The next day, after breakfast at our apartel, Jessica, Desiree, Ann, Joy, Jandy and I, with our guide Mr. Ramon Cabelo (retired municipal tourism officer), made our way to boat landing at Casa Chiesa for our “shooting the rapids” boat trip to Pagsanjan Falls, the star attraction of Laguna province. The site is under the supervision of the Parks and Wildlife Office of the Bureau of Forest Development. The falls is actually located at the rugged highlands of Brgy. Anglas in Cavinti, 3 miles outside Pagsanjan town, where it is called Magdapio Falls. However, the only passable route to it is the Bumbungan River of Pagsanjan. Pagsanjan Falls drops water from Cavinti River which is crossed by the overflow spillway on the road going to Lumot. Facing upstream, the left bank of the river belongs to Lumban and the right bank belongs to Cavinti. According to legend, there was only the river and no falls. There were two brothers, Balubad and Magadapio, who lived by the river. One day, the river dried up, the land dried up and plants and trees died. Balubad, the weaker of the two brothers, eventually died. He was buried near the mouth of the lake at the foot of the mountain (now called Balubad). In his thirst, Magdapio went up the gorge with his bamboo stick to survey the area. Finding it dry, he cried out in anger, hurling the stick at the rocks. Water soon gushed from where the stick struck the ground and soon flowed in a torrent forming the falls. Magdapio fell on his knees and thanked the Lord. He drank the cool waters and regained his strength. The first written account of a trip to the falls was written by American trader Joseph E. Stevens from Boston who made the trip on March 22, 1894, Holy Thursday. We decided to “shoot the rapids” early morning to avoid the rush of excursionists from Manila. The boat ride fee comes up PhP1,250 per passenger (includes personal injury insurance, hospitalization insurance, expenses for the helmet, life jacket, seat cushion, and a Cavinti entrance fee of P250 which entails a bamboo raft ride), with a maximum of three passengers per boat. We were all required to wear life vests and a sports helmet or hard hat as the boat sometimes moves close to big rocks which your head might hit. Also, falling objects, such as small stones, may fall down from atop the gorge. Our boats were provided with seat cushions for our seating comfort. The boat had no outrigger so getting into our boat required balance. Joy, Jessica and Ann rode on the first boat, with bankeros (boatmen) Russel Abary and Jeffrey Leron, while Jandy, Desiree and I rode the second with Antolin Penaloza and Roderick Equiz. The four were among 1,974 registered bankeros in the town. To be certified, every boatman must undergo rigorous training of at least one month. Our boatman already had 20 years experience behind him. Our rather slow river journey upstream to the falls started from Brgy. Pinagsanjan, near Magdapio Bridge. Our long fiberglass bancas were initially towed by a motorized banca to the first set of rapids. Our journey upstream was to last more than an hour. Our two boatmen had to paddle against the current to push the boat or use their feet to kick the rocks and propel the boat. We were constantly reminded to keep you hands inside the boat as you could easily lose a finger here. At places where the rocks were too many and the water too shallow, our boat slid over steel pipes placed at proper intervals. Along the way, we made a stopover at Talahib Falls in Sitio Talahib, Brgy. Caliraya (Lumban), about 900 m. downstream of Pagsanjan Falls, to admire its natural beauty. Talahib Falls is also called First Falls while the Pagsanjan Falls is called Main Falls. Before reaching the gorge and Pagsanjan Falls, our boatmen had to to negotiate the extremely deep waters of a broad bend or curve of a river locally called Kawa-Kawa. According to legend, the muddy bottom of Kawa-Kawa contains a giant bell whose thunderous peals frightened little children and pregnant women many years ago. The deep, magnificent gorge, hemmed by rocky cliffs 300 foot high, has lush tropical vegetation of vines, wild orchids and ferns. Its huge, natural swimming pool is clean, deep and very cold. The impressive 91-m. high falls is actually a series of five falls, one after the other in magnificent gradation. Two of them are close to each other and the last of the quintet is at the base. Behind the falls is the dark and mysterious Devil’s Cave or “Cave of the Demons” (so named because of the opening’s devil-like face profile). To get behind the falls, we all boarded a bamboo raft were raftsmen pulled on a series of ropes laid across the lagoon. Once at the far end, we had a glimpse of another cascade on top of the Main Falls. Another rope guided the raft behind and underneath the falls to the Devil’s Cave. The 5-km./2-hour “shooting the rapids,” the climax of the visit, is the actually the thrilling downstream return trip. Our boat wound through boulders as we passe the 14 relatively safe but roaring rapids of the Bumbungan River. The bankeros skillfully maneuvered our boats between rocks, alternately using their paddle or their feet. After the last set of rapids, our bancas now joined a convoy towed by a motorized banca back to the Casa Chiesa boat landing. Hidden on the mountainside of Sierra Madre Range, it cascades down to a lushly-vegetated rock pool and into a running stream which skirts tangled roots of ancient trees and widening stone pathways called butlog. It is a bit of a hike down steep, 4-wheel drive roads to get to the place. A short walk over a hanging bridge brings you to the top of falls. The stream itself flowed serenely through massive, ocher-colored rocks, creating pools of turquoise waters here and there before ending up in the 30-foot deep catch basin of the waterfalls. People sit under the waterfall for the best massage ever! Life guards, on both sides of the falls, are on duty when there are swimmers. The refreshing but extremely cold water is bright turquoise during the dry season and deep green during the wet season. Despite its popularity, it is very clean and well maintained. Go early in the morning as it gets very crowded in the afternoon, especially during holidays and weekends. There’s a small canteen at the entrance area where you can buy food, snacks, bottled water and soda. You can also bring your own cook food for a picnic lunch or buy fresh fish and meat to grill at Tanay Market (you can grill on their grilling area).You can also dine at several restaurants there and also ask them to cook food for you but it will all depend on what is available. There are picnic tables (PhP200) and sheds (PhP300), all constructed in such a way as to blend with the surrounding environment, plus souvenir shops (key chains, ref magnets, t-shirts, etc.) and parking (a bit tricky) on both sides of the narrow street (PhP30 for the parking fee). Rest rooms (PhP5 per visit)) are available near the entrance. Floaters (locally called salbabida) can be rented for kids (PhP30) and for adults (PhP50). Daranak Falls: Daranak Road, Brgy. Tandang Kudyo, 1980 Tanay, Rizal. Open daily, 8 AM to 5 PM. Entrance Fee: PhP50, Children below 3 ft. are free of charge. Additional Reminder: In compliance with Municipal Ordinance #2 Series of 2005, plastic and/or styropor are not permitted in Daranak Falls. Furthermore, alcoholic beverages and pets are not allowed. Overnight stay is not accommodated. 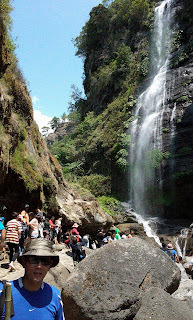 How to Get There: Daranak Falls is about 15 min. away from Tanay town proper. To get there, take an 8-km. jeepney ride to Brgy. Sampaloc and drop off at a turnoff for 2-km. hike along a dirt road to the falls. Take an FX (PhP70) or jeepney (PhP53) for Tanay. Terminal in front of Starmall EDSA is near Shaw MRT Station while the EDSA Central/Crossing United terminal is near the Unilever/Mandaluyong Police Station). Take an FX (PhP70) for Tanay at terminal near LRT Santolan Station. From Robinson’s Galleria, ride a G-Liner bus going to Taytay. Alight at Cainta Junction (Big R as landmark) then ride a jeepney going to Tanay (Fare: PhP40-45). Ride a jeepney going to Antipolo City (Fare: PhP32-35). Alight at Ynares Center and then ride an Antipolo toTanay jeepney (Fare: PhP28). All buses and jeepneys drop off passengers at Tanay Public Market Transport Terminal. From here, proceed to Daranak Falls Tricycle Terminal (PATODA Riders). Fare is PhP200 one-way, maximum of 4 pax/tricycle. Tanay Tourism Office: G/F, New Tanay Municipal Hall, M. H. del Pilar St., Tanay, Rizal 1980. Tel: (02) 7361059 and (02) 6551773 loc 212-213. Mobile number: (0998) 988-1590. E-mail: tanaytourism11@gmail.com. Website: www.tanay.gov.ph. The palatial setting of Villa d’Este is surrounded by a spectacular terraced garden, in the late-Renaissance Mannerist and Baroque style, which took advantage of the dramatic slope but required innovations in bringing a sufficient water supply, which was employed in cascades, water tanks, troughs and pools, water jets and impressive concentration of fountains, water games. This masterpiece of the Italian Garden is included in the UNESCO world heritage list. Reviving Roman techniques of hydraulic engineering to supply water to a sequence of fountains, the cardinal created a fantasy garden whose architectural elements and water features had an enormous influence on European landscape design and their garden planning and water features such as fountains, nymphs, grottoes, plays of water and music were much copied in the next two centuries, in European gardens from Portugal to Poland to St. Petersburg. The result is one of the series of great 17th century villas with water-play structures in the hills surrounding the Roman Campagna, such as the Villas Aldobrandini and Torlonia in Frascati; the Villa Lante and the Villa Farnese at Caprarola. Painter, architect, archaeologist and Classical scholar Pirro Ligorio was commissioned to lay out the gardens for the villa, with the assistance of Tommaso Chiruchi (he had worked on the fountains at Villa Lante) of Bologna, one of the most skilled hydraulic engineers of the sixteenth century. In the technical designs for the fountains, Chiruchi was assisted by Claude Venard, a Frenchman who was a manufacturer of hydraulic organs. From 1605 Cardinal Alessandro d’Estegave the go-ahead to a new progam of interventions. He restored and repaired the vegetation and the waterworks and created a new series of innovations to the layout of the garden and the decorations of the fountains. From 1660 – 61, works on 2 fountains were carried out involving Gian Lorenzo Bernini. In the eighteenth century the villa and its gardens passed to the House of Habsburg after Ercole III d’Este bequeathed it to his daughter Maria Beatrice, married to Grand Duke Ferdinand of Habsburg. The gardens were slowly abandoned and The hydraulics fell into disuse and ruin, and many of the collection of ancient sculptures, enlarged under Cardinal Ippolito d’Este, were disassembled and scattered to other sites. This picturesque state of decay continued, without interruption, until the middle of the 19th century. It was recorded by Carl Blechen and other painters. In 1851, Cardinal Gustav von Hohelohe, Prince of Hohenlohe-Schillingfürst, obtained the villa, in enfiteusi, from the Dukes of Modena. To pull the complex back from its state of ruin, he launched a series of works. Between 1867 and 1882, the villa once again became a cultural point of reference. The musician Franz Liszt (1811 – 1886), who evoked the garden in his Les Jeux d’Eaux à la Villa d’Este and composed Giochi d’acqua a Villa d’Este for piano while a guest here, gave one of his last concerts here in 1879. Jean Garrigue‘s volume of poems A Water Walk by Villa d’Este (1959) continues a long tradition of poetry inspired by the gardens. Kenneth Anger filmed Eaux d’artifice among the water features of the garden. Villa d’Este’s fame and glory as one of the finest gardens of the Renaissance was established by its extraordinary system of fountains. It has 51 fountains and nymphaeums, 398 spouts, 364 water jets, 64 waterfalls and 220 basins, all fed by 875 m. of canals, channels and cascades, and all working entirely by the force of gravity, without pumps. The gardens, now part of the Grandi Giardini Italiani, fall away in a series of terraces. The garden plan is laid out on a central axis with subsidiary cross-axes, refreshed by some 500 jets in fountains, pools and water troughs. Originally supplied with water by the Rivellese spring (which supplied a cistern under the villa’s courtyard), it is now supplied with water by the nearby Aniene River, which is partly diverted through the town, a distance of a kilometer. The Vialone, a large, 200 m. long terrace that lies between the villa and the gardens, was constructed between 1568 and 1569. It has a panoramic view of the gardens and countryside beyond and the Cardinals used the space for fireworks, games, spectacles and festivities. Originally shaded by two rows of elm trees (except for the space directly in front of the villa, left empty to preserve the view), the terrace is enclosed at one end by the Fountain of Europa and, at the other, by the Cenacolo, an immense loggia and belvedere, in the form of a triumphal arch, that provided shade beneath in summer, as well as commanding viewpoints of the scenery. Its interior, originally intended to be decorated with stucco decoration, gilding and frescoes, was never finished. The double loggia in the center of the terrace, made with travertine stone from 1566–1577, is attached to the facade of the villa. Two stairways provide access to the ceremonial salons on the lower floor. Its upper level, created as a terrace for the Cardinal’s apartments, contains a Nymphaeum (grotto) where the Fountain of Leda is located. The original statuary of the fountain, depicting Jupiter and Leda transformed into a swan and four children (Elena, Clytemnestra, Castor and Pollux), was sold in the 18th century and is now in the Galleria Borghese in Rome. The original fountain featured a novel hydraulic trick – water spouting from a vase held by Leda struck a metal disk, causing flashes of light to reflect on the walls of the grotto. The statuary has been replaced by headless statue of Minerva, found in the garden of the Palazzo Manni in Tivoli. The Fountain of the Tripod, a copy (the original is now in the Louvre) of an ancient Roman fountain in the center of the Vialone, has only been there since 1930. It consists of a marble basin supported by a central column and three pilasters. The Fountain of the Sea Horses, the original fountain on the site, was moved, by Ippolito, from Hadrian’s Villa to his garden. It is now in the Vatican Museum. The Fountain of Europa, at the northeast end at the top of the garden, was begun by Ippolito but was not finished until 1671. Its design, copying that of the Grand Loggia, consists of a triumphal arch with two orders (Corinthian and Doric) of columns. The large empty niche in the center once held a sculpture Europa Embracing the Bull which is now in the VIlla Albani in Rome. From Fountain of the Tripod, two ramps lead down to the upper garden and, at either end, there are symmetrical double flights of stairs. The shaded Cardinal’s Walk, attached to the retaining wall of the terrace, leads from one side of the garden to the other, passing by several grottos which are built into the retaining wall. The Grotto of Igea and Aesculpius, at the southeast end of the walk, just below the Fountain of Europa, is decorated with tartar flakes, mosaics and colored fragments of sea shells, and a small portion of the original fresco. It originally held two statues. The statue of Aesculpius, the God of Medicine, is now found in the Louvre while that of Igea, the daughter of Auesculpius and the Goddess of Healing, is now in the Vatican Museum. The Loggia of Pandora, in the middle of the Cardinal’s Walk, just below the center of the Villa, is covered, with arcades looking out at the garden. It contains a nymphaeum built into the wall and, originally, was decorated with mosaics and with two statues of Minerva and a statue of Pandora carrying a vase (actually a concealed fountain pouring out water) of water (symbolizing the evils of the world). The statues were sold in the 18th century. The staue of Pandora and one of the Minervas are now in the Capitoline Museum. In the 19th century, the nymphaeum was converted into a Christian chapel, a favorite place of the composer Franz Liszt, who dedicated two pieces of music to the chapel. The Fountain of the Bicchierone, one of two fountains created for the villa by Gian Lorenzo Bernini, was made between 1660 and 1661 on a commission from Cardinal Rinaldo I d’Este. The basin of the fountain, in the form of a large shell which reaches up to the level of the terrace, has a toothed Bicchierone (cup or chalice) in the center, from which water sprays upwards. Bernini supervised the building of the fountain and, following its inauguration in May 1661, had the height of the spouting water reduced, to avoid blocking the view from the Loggia of Pandora. Though not part of the original design of the garden, the fountain became a link between the architecture of the palace and the garden. The Loggetta of the Cardinal, a small ballustraded terrace between the Fountain of the Biccherone and the garden, was said to be the Cardinal’s favorite spot for reading and discussing poetry and art, and watching the construction of the garden around him. Surrounded by high laurel hedges and stone benches, it originally had a large statue (now found in the Louvre), installed shortly after the Cardinal’s death, of Hercules with the boy Achilles in his arms, overlooking the garden below. It was one of three statues of Hercules, in central positions along the central axis, that were all visible when seen from the bottom the garden, aligned with the loggia of the villa at the top. The Grotto of Diana, at the end of the Cardinal’s Walk, below the Gran Loggia, is a large underground vaulted chamber decorated from 1570-72 by Paolo Caladrino. It is completely covered with mosaics of mythological scenes, with images of fish, dragons, dolphins, pelicans and other animals, as well as the eagles and apples of the d’Este family. The rustic fountain, its central feature, has a statue of the goddess Diana in a large niche decorated with stucco reliefs of landscapes, the sea and a ship. Sold in the 18th century, all of these statues are now in the Capitoline Museum in Rome. Some of the original 16th century majolica floor tiles can still be seen. A walkway, below the Loggetta of the Cardinal, traverses the garden and passes by three grottoes. The Grotto of Hercules, in the center, is covered by the Loggetta of the Cardinal. Beneath it is a cistern and some of the hydraulic machinery for the fountains below. The grotto once had stucco reliefs of either animals or the labors of Hercules and a statue of Hercules in repose (now in the Vatican Museum). The Grotto of Pomona, similar in design to the Grotto of Hercules, has some of its original mosaic decoration still visible. The water from a white marble mask (found when the fountain was restored in 2002) pours into a fountain. The Oval Fountain (Fontana dell’Ovato) one of the first and among the most famous fountains in the garden, was designed by Pirro Ligorio as a water theater, spraying water in variety of forms. Begun in 1565 and finished in 1570, it was made by fountain engineers Tomasso de Como and Curzio Maccarono, with sculpture by Raffaello Sangallo. A massive stone basin, set against the semicircular back wall, cascades water into the fountain and sprays it into the air while water jets into the basin, from vases in the hands of statues of Nereids, and also sprays in fan shapes from vases in niches in the semicircular wall behind the fountain. An artificial mountain, rising above the fountain, symbolizes the Tiburtine landscape. The mountain is pierced by three grottoes, each pouring forth water, and is decorated with statues representing the Sibyl Albunesa with her son Melicerte, by Gillis van den Vliete (1568), and statues representing rivers Erculaneo and Anio, by Giovanni Malanca (1566), all of which pour water into the Oval Fountain. An upper walkway, above the fountain, leads past past the ring of basins and cascades. The Grotto of Venus, the fountain’s own grotto, was designed by Pirro Ligorio and built in 1565–68. It served as a meeting place for guests on hot summer days. A figure of Venus, similar to the Capitoline Venus, and two putti , the original statues of the grotto, are no longer there but traces of the monochrome murals of grotesque figures, tiles and sculpted grotto walls still remain. The fountain on a side wall, framed within a Doric, contains a sculpture of a sleeping nymph in a grotto guarded by d’Este heraldic eagles, with a bas-relief framed in apple boughs that links the villa to the Garden of the Hesperides. Flanking the central axis are symmetrical double flights of stairs that lead to the next garden terrace. The Grotto of Diana, richly decorated with frescoes and pebble mosaic, is on one side. Water rom the central Fontana del Bicchierone (“Fountain of the Great Cup”), planned by Bernini in 1660, issues from a seemingly natural rock into a scrolling shell-like cup. To descend to the next level, there are stairs at either end. La Rometta (“the little Rome”), an elaborate fountain complex, is at the far left. The boat, with an obelisk mast, symbolizes the Tiburtina island in the Tiber, below the statue of Rome Triumphant. The water jets of the Hundred Fountains (Cento Fontane), on the next level, fill the full length of a long rustic trough. The Fontana dell’Ovato ends the cross-vista. A visitor may walk behind the water through the rusticated arcade of the concave nymphaeum, which is peopled by marble nymphas by Giambattista della Porta. Above the nymphaeum, the sculpture of Pegasus recalls to the visitor the fountain of Hippocrene on Parnassus, haunt of the Muses. The 16th-century Fontana di Diana Efesina (Fountain of Diana of Ephesus) has water flowing from her numerous breasts, symbolizing fertility and abundance, both of nature and of intellect. The central Fontana dei Draghi (Fountain of the Dragons), dominating the central perspective of the gardens, was erected for a visit in 1572 of Pope Gregory XIII whose coat-of-arms features a dragon. It unites the terrace to the next. The sound of this fountain was in contrast to a nearby Uccellario with artificial birds. Central stairs lead down a wooded slope to three rectangular fishponds set on the cross-axis at the lowest point of the gardens. It is terminated, at the right, by the water organ (now brought back into use) and Fountain of Neptune (belonging to the 20th century restorations). The very formal Fountain of the Owl, at the southwest part of the garden, below the Fountain of Rometta and the Fountain of Proserpina, was built between 1565 and 1569 by Giovanni del Duca, These 3 fountains have terraces connected by stairways, with nymphaeums placed beneath the terraces. Placed on a terrace surrounded by walls with niches, it crowned with the white eagles and lily symbols of the d’Este. The fountain, covered with polychrome tiles, has the coat of arms of the d’Este, held by two angels, at the top, above the niche flanked by Ionic columns. Though the architectural elements are intact, the statues of two youths holding a goatskin which poured water into a basin held by three satyrs are missing or were destroyed. The sculpture in the niche, believed lost, was rediscovered during a renovation in 2001–02, hidden under mineral deposits and earth. During the restoration work of 2001–02, the workers found some of the original mechanism that produced the bird songs, including the wind chamber, the tubes that moved the air and water, and the machinery that made the owl move. Using modern materials, Leonardo Lombardi was able to make a new version of the old machinery so the birds can sing and move again. The series of terraces above terraces and the imposing constructions in the hanging cliffs of the “Valle gaudente” bring to mind the Hanging Gardens of Babylon, one of the 7 wonders of the ancient world plus, the addition of water (including an aqueduct tunneling beneath the city) evokes the engineering skill of the Romans. Its landscape, art and history (which includes the important ruins of ancient villas such as the magnificent Villa Adriana) as well as a zone rich in caves and waterfalls (which display the unending battle between water and stone) is generally considered within the larger and, altogether extraordinary, context of Tivoli itself. Villa d‘ Este: Piazza Trento, 5, 00019 Tivoli, RM, Italy. Tel: 0039 0412719036. Fax: 0039 0412770747. E-mail: villadestetivoli@teleart.org. Website: www.villadestetivoli.info. Open 8.30 AM – 6.45 PM (May to August), 8:30 AM – 4 PM (January, November, December), 8:30 AM – 4:30 PM (February), 8:30 AM – 5:15 PM (March), 8:30 AM – 6:30 PM (April), 8:30 AM – 5:30 PM (October) and 8:30 AM – 6:15 PM (September). Admission: € 8.00. The visitor can take pictures without any physical contact with the cultural heritage and he cannot use either flash or tripod. Taking the blue regional COTRAL busRoma Tivoli-Via Prenestina at the bus terminal just outside Ponte Mammolo station of metro line B; the stop Largo Nazioni Unite is about 100m far from the entrance of the Villa. Taking the urban train line FL2 (Roma-Pescara Line) from Tiburtina stationto Tivoli station (Stazione Tivoli), then, local bus CAT number 1 or 4/ to Piazza Garibaldi stop; the stop is in Tivoli’s main square in front of the Villa. On our third day in El Nido, after breakfast at The Resort Bayview Hotel El Nido, members of B.E.A.T. (Business Executives Alliance in Tourism) again boarded their van for another round of resort-sponsored familiarization tours of the town. Our first destination was to be Bulalacao Waterfalls, one of the most beautiful falls in the town. It is actually a series of waterfalls aptly named Big Falls and Small Falls. The 70-ft. high Big Falls is a 2-part trek that first requires you take a 45-min. tricycle ride to Brgy. Pasadeña and, upon arrival, make a grueling 1.5 to 2-hour hike (not to be undertaken without a guide and must not be attempted during the August to October rainy season) down a heavily-vegetated trail that courses through rice paddies and a thicket of towering ipil, balete and kamagong trees. We were to visit the easier and more accessible Small Falls (also called Naganlec Falls). Upon arrival at the start of the trail, we first paid the PhP25/pax entrance fee (payment for the family that keeps the trail clean). The trail to the falls was well shaded by trees and marked. The hike through the forest took all of 20 mins. and we had to make 5 boulder-strewn river crossings, its cool waters a refreshing break for us as it was quite humid that day. As we got closer to the falls, we again had to pay a PhP50/pax entrance fee, this time for the family that keeps the area around the falls clean. This place was a really nice and there were two huts with picnic tables. The Small Falls, with 4 accessible levels, was calm and inviting. The first and lowest has a large pool that people can jump into from the cliff above as it has a 3 m. depth. A number of foreigners tried it. However, most of us tried out the easy-to-reach second level which has a beautiful low cascade and a shallow, swimmable pool that everyone enjoyed. It was a nice, cool and refreshing break from the heat of the morning sun. It may not be a large fall but it has a great little swimming area. Bulalacao Falls: Sitio Naganlec, Brgy. Pasadena, El Nido, Palawan. The Resort Bayview Hotel El Nido: Sitio Marimegmeg, Brgy. Corong-Corong, El Nido, 5313, Palawan. Tel: + 66(0) 76 281 406. Fax: + 66(0) 76 384 369. Mobile numbers: (0915) 250-7368 (Globe) and (0920) 975-8690. E-mail: theresortelnido@gmail.com. Website: www.elnidobayview.com. After checking in at Sta. Fe Forest Park, we still have free time before covering the Kalanguya Festival the next day so Rollie, Gener, Mon, Alex, Roel and I opted to explore the town’s Imugan Waterfalls, one of the town’s natural attractions. Ms. Ma. Theresa Farrah Dugay, Sta. Fe’s Municipal Tourism Officer assigned Mr. Emmanuel A. Caramat, Ms. Melany C. Lazaro and Mr. Regie Catalbas as our guides. We all boarded our van for the 7-km./30-min. drive to the jump-off point at Brgy. Imugan for the hike to the falls, arriving there by 3 PM. At the barangay hall, we observed a float being prepared for the next day’s Kalanguya Grand Parade. Their float’s theme is centered on the ubiquitous, pear-shaped and light green chayote (Sechium edule, locally called sayote), the barangay’s principal produce. According to Emmanuel, the nearly 1-km. hike to the falls would take us around 30 mins. The initial part of our hike was along a cemented pathway between an irrigation canal with flowing spring water and newly watered rice paddies. After crossing a stream, we now traversed a narrow, leaf-strewn but mildly graded dirt trail through a light dipterocarp forest. The hike was scenic all throughout, with views of a hanging bridge and the boulder-strewn stream emanating from the falls below us and, along the trail, of wild orchids clinging to trees, giant ferns and stems of tiger grass (scientific name: Thysanolaena maxima), used in the manufacture of the popular walis tambo or soft broom). Also along the way we passed numerous orchards of sayote, all sprouting on vines clinging to a moderately-spaced mesh of G.I wire and supported on poles along the steep slope of the mountain side. After rounding a U-shaped bend along the trail and crossing a stream, we soon heard the rush of falling water signaling our arrival at Imugan Falls which is located between two mountains in the Caraballo Mountain Range. With a height of about 35 ft. and falling in 2 levels, its refreshing mountain spring waters drop down into a shallow catch basin. As we didn’t bring bathing attire, we didn’t swim its bracingly cold waters but we did savor its natural beauty, pristine setting and quiet surroundings. To the left of the falls are some rather steep steps carved into the rock face which, according to our guides, lead to the fall’s smaller first level which also has a basin. We passed on this opportunity though and, instead, made our way back to Imugan. Our hike to the falls was truly a fitting start to our visit to Sta. Fe. After our butanding (whale shark) interaction at Brgy. Tan-awan, we boarded our airconditioned van for the short 10-min. drive to Tumalog Falls, another great attraction of Oslob. A visit here is usually combined with your swim with the butanding. The van can only bring us at the entrance since the paved road from there on is very steep. From hereon, we could either make a 15-min. hike (a good hike and a warm up for your body) or go via a habal-habal, the local term for riding a motorcycle and ride at the back of the driver. We all chose the latter. The habal-habal ride along the rather steep, 50-degree inclined road going up the mountain is no joke and was an experience by itself. Along the way, we could already behold the beauty of the postcard-pretty, imposing and multi-tiered falls hidden away in a forest. The falls was really awesome! For city people like us, a view like this was really a breathtaking experience. The beautiful mountainous scenery, with moss hanging off the mountainside and many fine areas of misty water spread out over a glistening green moss mat, was one of the most breathtaking nature scenery that I have ever seen, reminding me of Avatar movie forest scenes. The local government has installed concrete stepping stones, making it easier and safer for us to walk around. I got a cool feel from the mist of the falls and savored the soothing and very calming sound of falling water as I tried to enter its waters to wash away the sea salt after swimming the ocean during my previous butanding interaction. Bbbbrrrr, it’s really damn cold! However, I soon got used to the cold. The falls has a unique appearance very distinct from all the other waterfalls that I have seen. As the drizzle from the falls touched my face, the stress from my head, shoulders down to the tip of my fingers, all tired from arduous swimming and flipping at the butanding interaction, were all washed away. You cannot really swim here since the falls is not that deep, around 3.5 to 4 ft. (a nice and safe swim for kids), but the sight is exhilarating and refreshing. The bracingly cold water was clean and the pools they flowed into were clean as well. People around us all seemed to be enjoying. There were families having picnics at some nearby open wooden huts; others were busy taking candid and dramatic photos at the fall’s nooks and crannies, all green with moss and wild growth; while others just bathe. There’s even a small pool, where the water from the falls overflows, where you can a fish spa experience, dipping your feet and letting small fish eat your dead skin off. Definitely a good place to chill and relax. Despite the many tourists that visit it, it was still a very well maintained area. For those who get local “guides,” they are experts at suggesting the best areas to take pictures. Aside from the very beautiful falls and the magnificent rock formations, there are also wonderful bamboo trees around, all perfect for photos. I even saw a slightly visible rainbow created by the lovely rays of sunlight hitting directly through the falling waters. I was only able to take shots of the falls from a distance but, luckily for me, Liana brought along her waterproof camera. After the heart pounding whale shark encounter in Oslob, seeing and savoring Tumalog Falls brought my blood pressure back to its normal level. I could have stayed there for the whole day. Such a breathtaking natural sight makes you realize that, yes, there is a God. It also felt mystical (I was half expecting fairies to show up). Truly, nature knows how to show off. This has been one of the most surreal places I have ever been! Despite the booming tourism of Cebu, this place has been not touched by too much commercialism and this natural treasure needs to be kept in its natural form to retain the pristine beauty for all generations to see and experience. The falls does not have a closing time but it does not have lighting at night. Food is not available in the falls area so bring your own. There are no tables, no lockers, some benches, no vendors, no food stalls, no changing rooms and no lounge area. A rudimentary gender specific bathroom is available. Be careful in slippery parts and protect your camera gear since the falls exudes droplets of water. For those making a return hike, the store at the entrance, near the parking lot, offers refreshments such as young coconut, banana cue and soft drinks. Tumalog Falls: Brgy. Tumalog, Oslob, 6025 Cebu. Admission: PhP20. How to Get There: From the Oslob whale watching station in Brgy. Tan-awan, you can hire a habal habal (140/pax) or a multi cab (600 for 5 pax), both round trip, to get to the entrance. They are parked and available at the entrance of the whale shark center, near the main road. From the highway, it is a 5-min. habal-habal ride to entrance. The habal-habal ride to the falls costs PhP30 (one-way) and PhP50 (round trip). Upon arrival at Loboc, we all crossed over to the other bank of the Loboc River, via the Alfonso L. Uy Promenade, to get to the Loboc Tourism Complex where the floating restaurants are docked. It has been 11 years since the last time I had my first Loboc River Cruise with my family and I was curious as to what’s new with the cruise. This time, I now notice so many improvements in the area. Well for one the floating restaurant terminal is now concreted, there are now lamp posts along the river banks (for night cruises), helpful directional signage and an orderly parking lot, the restrooms are clean and the complex was wi-fi enabled. This made the complex an exceptional tourist attraction by itself. When we got to the boat terminal, we were all whisked to the waiting double-hulled floating restaurant of Village Floating Resto & Cruises. The setup this time was different from our past typical boat tour. Instead of different tables for different groups of guests, a long, flower-bedecked table was instead set up with green table cloth and fresh buco in the shell for each one of us. Our lunch was also to be something different, not the typical buffet. When our boat got underway, we were first entertained by a local band with a versatile and talented female lead vocalist singing bossa nova songs for our listening pleasure. This got us in the mood for lunch, however late it was. It consisted of pork humba, chicken inasal, sisig-stuffed squid, grilled vegetables, pinais na isda and corn on the cob plus steamed rice, all laid out on banana leaves. Our delightful lunch was capped by a series of desserts consisting of ube pannacotta, bananacue, puto cuchinta and fruit skewers. In about an hour, our boat reached the endpoint of our 2-km. cruise – Busay (or Tontonan) Waterfalls. These series of low waterfalls, used to generate electricity for the town, drops 15 m. in 2 stages. We were already done with lunch when docked near a floating wooden platform with rope railing. Alighting here, we had the luck of seeing a rare rainbow beneath a nearby small waterfall. After a few minutes at the viewing deck, we again boarded our boat and, when all were accounted for, turned around for our return trip upriver. Along the river, the boat stopped at a small bamboo and nipa jetty decorated with banderitas and colorful guitars hung on the rafters. Here, some locals, dressed in apple-green filipiniana outfits, provided us a culture show, dancing the kuradang and the tinikling. Continuing on our return cruise, our band, not to be outdone, also regaled us with a modern dance number. Soon enough, we back at the boat terminal by 3:30 PM, totally refreshed by this showcase of Boholono hospitality, cuisine and culture and quite ready for our next adventure. Village Floating Resto & Cruises: Brgy. Valladolid, Loboc, Bohol. Tel: (038) 537-9223 and (038) 501-8078. Mobile number: (0928) 507-7627. E-mail: villagefloatingresto@yahoo.com. Upon arrival at Antipolo City, the first place Jandy and I visited was the 12 m. high Hinulugang Taktak, one of the two most popular tourist spots in Antipolo City, the other being the Antipolo Cathedral, and the nearest waterfall to Metro Manila. Officially the Hinulugang Taktak Protected Landscape, it was formerly called the Hinulugang Taktak National Park, declared as such by the Department of Environment and Natural Resources (DENR). Historical accounts say that our National Hero Jose Rizal frequented this falls. On June 15, 1952, it was declared a recreation area by then Pres. Elpidio Quirino and, in 1990, the waterfall was proclaimed as a National Historical Shrine by the National Historical Institute (NHI) by virtue of Republic Act No. 6964. It became an integral part of the country’s system of protected areas under Republic Act No. 7586, the National Integrated Protected Areas System (NIPAS) Act of 1992. It is now under the control of the DENR by virtue of Proclamation No. 42 and it’s area has been expanded from 0.89 hectares to 3.2 hectares. The park was closed to the public and undergoing rehabilitation when we arrived but we were allowed in by the caretaker. We went down a series of concrete steps flanked by kupang, acacia, ilang–ilang and mahogany trees. There are also cottages, common barbecue pits, public toilets and swimming pools. When we arrived at falls’ basin, I was greeted by an awful smell and the sight of a pool with waters thick with foam and soap suds (from detergent diluted in dirty water), more like a giant washing machine. At its fringes are raw waste, sewage and assorted garbage, coming from illegal settlers and some of the city’s drainage systems, which flow into the river and its tributaries (including the Pasig River), all prey to rapid urbanization. As such, its waters are polluted and not suitable for swimming (visitors here just use the swimming pool located downstream). The falls is just for viewing. However, the city government and the DENR are now working with private groups for a PhP100 million makeover, in 10 to 20 years, to restore and preserve the glory and natural beauty of this once famous and idyllic waterfall. The basin is regularly cleaned but this is an exercise in futility as illegal settlers upstream continuously throw garbage. Studies to clean the water included putting up fences along the river, diverting the dirty water (and using artificial water for the falls) or setting up a filter to clean the water before it drains into waterfall, but these ways only tolerate those who throw the garbage. They have to make the people realize the importance of Hinulugan Taktak and that saving it is everybody’s responsibility. They have to CHANGE people’s attitudes. Hinulugang Taktak Protected Landscape: Taktak Road, Brgy. Dela Cruz, Antipolo City, Rizal. Email: admin@hinulugangtaktak.com. Admission: PhP8 per pax, additional PhP15 per pax if you use the swimming pool. City Tourism Office: City Hall, Antipolo City, Rizal. Tel: (632) 630-6974, (632) 697-1021 & (632) 644-2837. How To Get There: Antipolo City is located 29.45 kms. from Manila. The city is accessed by 3 routes: from Marikina via Sumulong Highway from Cubao Quezon City; via Marcos Highway (which extends to Quezon Province) through the Marikina-Infanta Road; and from Makati City and San Juan via the Ortigas Ave. Ext.. Jeepneys to Antipolo City are available in Cubao (Quezon City). Upon reaching Taktak Rd., alight and then take a tricycle or walk towards the falls. After our orientation at Zipline Inn, we again boarded our van for the drive to the barangay hall of Brgy. Tuno where we secured the services of local guides Arnel Vicente and Marialyn Benito for our trek to the 7-tiered Bugtong Bato Falls, so called because it is perched in the midst of a lone rock. The first three waterfalls, with heights up to 150 ft., are easily accessible. Zipline Inn owner Ms. Ofelia Gaal also joined us on this hike to her property. According to her, it just takes her 25 mins. to get to the falls but I figured it would take me much longer with my mobility issues due to osteoarthritis. We just brought along our essential gear – cameras, water, hats, etc. The hike, through a craggy mountain trail, took us past streams, lush forests, beautiful rice terraces and over two bamboo suspension bridges. Hiking through this incredible countryside was worthwhile and a treat by itself, even without the falls at the end of the trail. Along the way we also encountered some grazing cows as well as a number of fallen trees, visual evidence of the destruction wrought by Typhoon Yolanda (international name: Haiyan) on the town. Surprisingly, in under 40 mins., we arrived at the beautiful falls and our prize for completing the hike – its inviting swimming hole. It is thus with great anticipation that we dipped our tired bodies in its cool, refreshing water. In my excitement though, I forgot to remove my belt bag with my cellular phone in it. A total loss. Oh well. After a while, we decided to try out the second waterfall. Getting there entailed a short but steeper climb up a staircase with a stout nylon rope to assist us, much too challenging for Maricar who decided to stay behind. Once up there, it offered another cool, inviting swimming hole for us to swim in. The third fall, visible from here, was a different story as it was accessible only by swimming across this second swimming hole and then climbing another nylon rope up the slippery side of the waterfall. Tricky to say the least. Still, I admit to being envious seeing the others do it. If only I were 20 years younger. Only Clelia and Rupert, as well other visiting foreign tourists, attempted this. The third falls offers the smallest but the most beautiful of the three swimming holes, said to have deep blue waters. Katahum Tours: Tibiao, Antique. Mobile numbers: (0919) 813-9893 and (0917) 631-5777. E-mail: flord@tibiaofishspa.com. Website: www.katahum.com. How To Get There: Tibiao is located 73 kms. from San Jose de Buenavista, 12.6 kms. from Barbaza, 17 kms. from Culasi and 89 kms. from Brgy. Caticlan (Malay, Aklan). After our early morning sun rise tour, we returned to our jeepney and made our way back to our inn where our breakfast awaited us. Thus filled, we made preparations for our scheduled hike to the huge, picturesque and impressive 40-m. high Bomod’ok Waterfall (a.k.a. Big Falls), one of Sagada’s most visited tourist attractions. This waterfall flows down to Amlusong Creek to join the Chico River. Despite 2 past visits to Sagada, this would be a first for Jandy and me. Joining the hike were Ms. Jocie Dimaculangan (our tour coordinator), Ms. Diosa Diaz, Ms. Eureka Joy Bueno, Ms. Joy Tenejero, sisters Jessica and Jasmin Bez, Ms. Long Garcia, Ms. Desiree Benitez, Mr. Donald Danao and couple Lilia and Aldrin Tejada. We left our jackets and bonnets and, instead, donned hats; light, quick-drying sport shirts and jogging pants; slippers and rubber sandals. I also wore my belt bag while Jandy toted a small backpack with our water and provisions. We, however, forgot to put on some suncreen lotion. We again boarded our hired jeepney and proceeded on a 20-min. drive to the Tourist Information Center in Brgy. Bangaan where we met our two Kankanai lady guides: Ms. Joanna Tumag and Ms Norma D. Padawil. There were already lots of tourists gathered at the basketball court, the jump-off point for the trek. As we were early, there were still a lot of walking sticks available for us to choose from for use during our hike, free of charge. This supply would be exhausted by noontime. After a quick briefing by our guide Joanna, we began our trek by descending down a series of concrete steps carved along the mountainside. During the initial part of the hike, everyone was in the upbeat and jocular mood, especially our friends Jess, Joy and Desiree. Halfway through the hike, the heat, thirst, exhaustion and aching muscles would change all that. From afar, we could espy verdant Aguid and Fidelisan Rice Terraces, both chiseled out from an entire huge, rounded spur of a mountain, giving it the appearance of one single work. After about 45 mins., we entered the village of Fidelisan, the oldest in town and the heart of Northern Sagada’s villages. Visitors here have to register and pay an environmental fee of PhP10. Here, we passed by a traditional house and, beside a sari-sari store, a dap–ay (or a–to), an all-important open communal meeting place for male elders made with stone slabs (tourists are not allowed to enter here). Further out, we noticed a cable line system, powered by a car motor, used to transport gold and copper mine tailings. Ingenious at best but, sadly, I’m no fan of the destruction that mining, whether small or large-scale, causes to the environment. From hereon, the rest of the hike would be via cross-terrace walking wherein we had to maintain our balance as we traversed a maze of rice terraces via the narrow, meandering paddy walls (locally called pilapil). This afforded us the opportunity of observing the ingenuity of the terraces up close, including how the rocks were piled one on top of the other (those in Banaue use compacted earth); the efficient irrigation system; and the muyongs, the hydrological system that irrigates these terraces. The paddy walls are not always open to tourists (especially during obaya or sacred holidays) as it is taboo to disturb the paddies during the weeks when the rice panicles are ripening. After a 1.5-hr. hike, we soon espied the top off the towering waterfalls which had a wide and deep pool. As it was the Holy Week break, the area was packed with local and foreign tourists. Enough light for sunbathing was still available, it still being morning, but taking a dip had to be done in stages as the water was icy cold. Some intrepid daredevils made high dives, legs first, from a promontory just below the falls. We left the falls by 11 AM and retraced our steps back to Fidelisan. By now, there were lots of tourists making there way to the falls and we had to wait many a long time for them to pass through as the paddy walls were just wide enough for one person. It was now noontime and uphill to Fidelisan and we were gasping for breath and taking a few minutes of rest every few steps. I was dripping buckets of sweat and ready to collapse when we reached the village. Upon arrival, we were saved by the sight of enterprising villagers selling cool and refreshing, one-of-a-kind halo–halo (PhP20/glass). Aside from the usual sago and gulaman, they also added the unusual mango and melon bits and macaroni with the shaved ice and evaporated milk. From Fidelisan, we took the right trail to get to Aguid. There, our hired jeepney awaited us to take us back to town.